The Navy's newest guided missile destroyer was christened Saturday with the name of a fighter pilot who spent 7 1/2 years in captivity in North Vietnam, received the Medal of Honor and served as presidential candidate Ross Perot's running mate. Four Medal of Honor recipients and seven former prisoners of war attended the ceremony at Bath Iron Works that marked a milestone in construction of the 9,200-ton ship named for Vice Adm. James Stockdale. Stockdale's widow, Sybil, who suffers from Parkinson's disease and uses a wheelchair, let loose a champagne bottle propelled by rope that swung across the Stockdale's bow. On the second try, the bottle exploded, the band broke into "Anchors Aweigh" and red, white and blue streamers filled the air. Stockdale, who died nearly three years ago at age 81, flew 201 carrier-based missions before being shot down in 1965, becoming the highest-ranking naval officer captured during the war. His endurance under torture and years of solitary confinement during his captivity in Hanoi became the stuff of legend. After his release in 1973, he received 26 combat decorations, including the Medal of Honor. Sybil Stockdale, who founded an organization to draw the public's attention to the plight of American POWs in Southeast Asia, was accompanied at the ceremony by the couple's four sons. Although James Stockdale is perhaps best known for his 1992 run as Perot's vice presidential nominee, the family remembers the campaign as a minor footnote to a distinguished military and academic career. The brief foray in politics was actually a fluke, said Stockdale's son, Sidney. His father came to know Perot through his work with Sybil Stockdale at the League of American Families of POWs and MIAs. James Stockdale agreed to serve as a stand-in on Perot's presidential ticket. But after Perot dropped out of the race, then changed his mind and got back in, there was no time to line up a replacement. A far more significant aspect of Stockdale's life was his study of the philosophy of Stoicism, particularly the writings of the Roman scholar Epictetus, his son said. The philosophy, which emphasizes the value of fortitude and self-control, served Stockdale well by providing him strength during his years in captivity, his son said. "He was subject to the control of the people who held him, but there were things he could do to maintain his honor and control himself," he said. Stockdale established clandestine methods of communication, set up rules to guide POWs and thereby empowered himself and his fellow Americans against an enemy with absolute control over their lives, his son said. Stockdale was a friend of author Tom Wolfe, who was fascinated by his research into Stoicism and was inspired to make the ancient philosophy a central theme of his 1998 best-seller, "A Man in Full," Sidney Stockdale said. 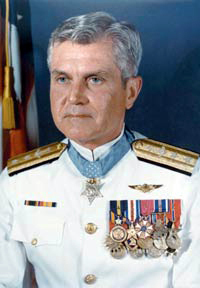 After retiring from the Navy in 1979, James Stockdale served as president of The Citadel and later became a senior research fellow at the Hoover Institution at Stanford University. He wrote several books, including his 1984 autobiography "In Love and War," co-written with his wife, which became a made-for-television movie. Noting that the new destroyer's motto is "Return with Honor," Sen. Susan Collins, R-Maine, said "Admiral James Stockdale did just that, and our nation is forever indebted to him. I know that all who serve on the ship that bears his name will do the same." Other speakers at the christening included Adm. Patrick Walsh, the vice chief of naval operations, and Reps. Tom Allen and Michael Michaud, both D-Maine. About two dozen antiwar demonstrators brandished placards outside the shipyard as guests arrived. Police said the protest was peaceful and there were no arrests. The Stockdale, the 56th destroyer of the Arleigh Burke class and the 30th to be built at Bath, is scheduled to undergo sea trials in September and be delivered to the Navy a month later. 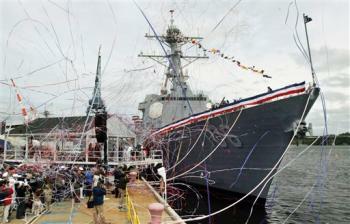 It will sail early next year to its home port of San Diego, not far from where its namesake had retired. The shipyard is in line to build four additional Burke vessels before it completes the transition to the new DDG-1000 Zumwalt class, a larger, more stealthy destroyer whose prototype is expected to be delivered in 2014.